By Joshua Figueroa, Story Seeker. Lee, Matthew J. The Boston Pops orchestra performing during their annual July 4th concert, 2010. Digital Image. “Pops announces special guests for July 4.” Boston Globe. June 25, 2015. https://www.bostonglobe.com/arts/music/2015/06/25/pops-announces-special-guests-for-july-fireworks-spectacular/idd1Lfj8MXrYZ1pU4mymJL/story.html. July 4, 1976 was an evening that Walter Cronkite would call “the highpoint of a day marked by crescendos.” On the United States’ bicentennial, the Boston Pops Orchestra gave a performance that would begin a decades-long American tradition. For the audience in attendance and the millions across the nation watching on television, one piece in particular seemed to perfectly sum up the patriotic splendor of that American evening--even though it was Russian. This July 4th, The Austin Symphony will present the annual H-E-B Austin Symphony July 4th Concert & Fireworks at Vic Mathias Shores. The program includes various patriotic classics, with composers like George Gershwin, John Williams, and John Philip Sousa. Tchaikovsky’s 1812 Overture is part of the program as well, and will undoubtedly be on the docket for many ensembles throughout the country. But just how did this piece of Russian music come to symbolize American Independence Day? Kennerly, David Hume. 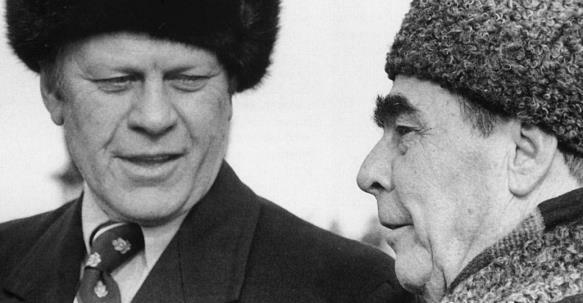 President Ford and General Secretary Brezhnev meet in Vladivostok to discuss strategic arms limitation, 1974. Digital Image. “The Vladivostok Summit Meeting on Arms Control.” Ford Library Museum. https://www.fordlibrarymuseum.gov/library/exhibits/vladivostok/varrival.asp. Accessed June 24, 2017. For historical context, although America and the Soviet Union had reached a warming period (or “détente”) by 1976, the Cold War was still very much ongoing and U.S.-Russian relations were a delicate matter. Lejeune, Louis-François. Battle of Moscow, 7th September 1812, 1822. Painting. “Battle of Borodino.” Wikipedia. https://en.wikipedia.org/wiki/Battle_of_Borodino. Accessed June 23, 2017. 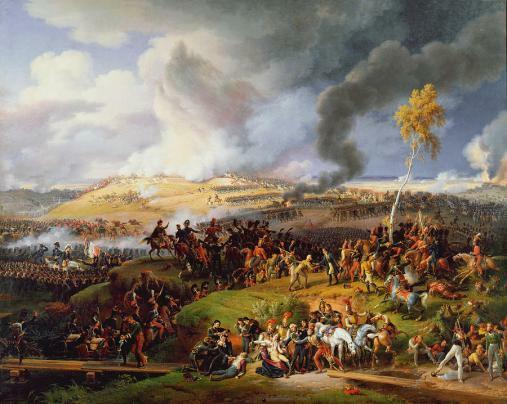 Although Napoleon technically won the Battle of Borodino, some historians argue it was a pyrrhic victory. Le Grande Armée suffered tremendous losses, they never technically got a Russian surrender even when they invaded Moscow, and the journey back to France (with the encroaching Russian Winter and rallying Russian armies) proved grave. Napoleon went into Russia with 600,000 men and came back with 93,000. Almost one hundred years later, the 1812 Overture found new life with the help of Arthur Fiedler of the Boston Pops Orchestra. First hired as its conductor in 1930, Fiedler’s fifty-year career brought the Boston Pops into an era of world-wide recognition. This was in part because of their very popular light-classical and pop-centric performances and recordings. Fiedler was an unwavering enemy of staid programming, saying “snobbism is the thing I’ve been trying to fight all my life, every chance I get.” And fight he did with recorded arrangements of bands like The Beatles and The Carpenters. 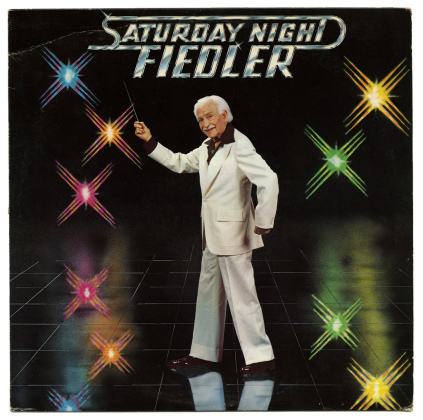 Fiedler even covered the soundtrack to the film Saturday Night Fever, aptly titled, Saturday Night Fielder. Goldsmith, Lynn. Album Art for Saturday Night Fiedler, spoofing the movie poster for Saturday Night Fever, 1979. Digital Photo. Flickr. https://www.flickr.com/photos/bartsol/9209763923/sizes/l/. Accessed June 23, 2017. In addition to being an offbeat conductor, Fiedler also had interesting friends, such as young Bostonian millionaire, David Mugar. The two were as thick as thieves and shared a unique hobby: listening to police radio alerts so they could drive over and watch firefighters put out infernos. One morning in the summer of 1973, David Mugar worked up the courage to suggest to Fiedler (who hated unsolicited advice) a way to grow the attendance of the Boston Pops Esplanade concerts. The Esplanade concerts were a series of free, outdoor performances held every year by the Boston Pops Orchestra. The tradition began in 1929, but by 1973 attendance for these concerts was steadily declining. Mugar suggested that the next Esplanade concert should feature the 1812 Overture, that it should utilize real cannon and fireworks, and he was willing to foot the bill. Fiedler agreed. Luckily, the Esplanade concerts always took place around July 4th, making the 1812 Overture the perfect piece to go along with the fireworks-riddled holiday. Arthur Fiedler sitting in a fire engine, 1955. Digital Image. “The Arthur Fiedler Collection.” Boston Fire Museum. http://www.bostonfiremuseum.com/Donate.html. Accessed June 24, 2017. 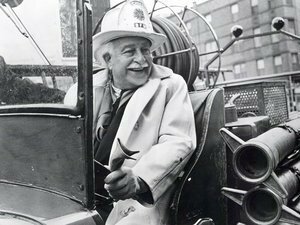 Fiedler Fun Fact: By 1979, Arthur Fiedler was made an honorary Fire Chief in over 300 cities around the world. For their inaugural July 4th concert in 1974, Fiedler and Mugar expected around 15,000 attendees. They got 75,000. The success of the concert prompted them to grow this one-off event into a tradition. Two years later in 1976, a jacket-less Fiedler and the Boston Pops Orchestra performed for a live audience of 400,000, setting the Guinness Book World Record for the largest crowd ever assembled for a classical music concert. The performance was presented again a week later as part of the CBS highlight reel, In Celebration of US: Our Happiest Birthday, which was broadcast to millions of viewers. Tomas, Ricardo. 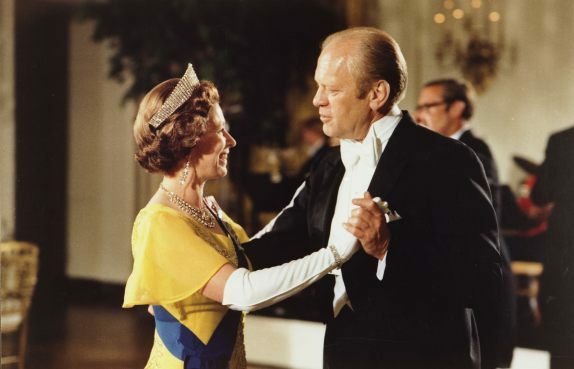 Queen Elizabeth II and President Ford dancing during her visit to the US in celebration of the bicentennial year, 1976. Digital Image. “Entertaining Royalty: The State Dinner for Queen Elizabeth.”Ford Library Museum. https://www.fordlibrarymuseum.gov/library/exhibits/queen/queen.asp. Accessed June 24, 2017. There was a lot going in the country the year of the Bicentennial. Queen Elizabeth II visited with President Ford, fire hydrants everywhere were getting painted red, white, and blue, and George Washington was posthumously promoted to the rank of General of the Armies of the United States. The original premiere of the 1812 Overture was not as celebratory as the performances we experience today. In the aftermath of Alexander II’s assassination in 1881, the fanfare of the 1812 Overture wasn’t very appropriate for the times. When the piece premiered in 1882, the cathedral it was meant to help christen lay unfinished. It was performed during the All-Russia Arts and Industry Exhibition, under a tent, without cannon. Today, the 1812 Overture lives on as it was originally meant to, as a piece of joyous celebration. From the coast of Santa Barbara to the Esplanade in Boston, wherever you are this July 4th you’ll likely hear the 1812 Overture in some form or another. Although it’s a bit strange that Americans often commemorate Independence Day with a Russian tune, its performance can also be seen as a celebration of one conductor’s life-long mission: to give fun, even bombastic music to everyone who wants to listen. The Boston Pops Orchestra performing The Battle Hymn of the Republic and The 1812 Overture, 1976. Digital Video. “Boston Pops 1812 July 4, 1976 Bicentennial.” Youtube. https://www.youtube.com/watch?v=Z-fGZzS2M1s. Accessed June 23, 2017.